Evidence of historic predation is important to understand the role that predators play in molding fundamental aspects of primate biology. We examined the geographic demise of Prolemur simus from the perspective of its past behavioral ecology. Using paleontological data from the Late Pleistocene–Holocene deposits at Ankarana Massif, northern Madagascar, we test the hypothesis that 1) multiple predators preyed on P. simus in the past and 2) the dietary preferences and habitat preferences of subfossil P. simus were similar to its extant counterpart. We examined 381 subfossil craniodental remains of P. simus from Ankarana. We used dental eruption and macrowear to assign craniodental remains to relative age classes, and carbon (δ13C) and nitrogen (δ15N) stable isotope values in bone collagen to assess variation in this species’ diet and habitat. Skeletal evidence of predation suggests that multiple predators consumed P. simus in the past. Evidence for carnivoran predatory activity includes punctures on the viscerocranium, posterior neurocranium, and angle of the mandible. Evidence for raptor predatory activity includes talon nicks, punctures, and “can-opener” perforations within the orbits or palate. Stable isotope data suggest that the diet of P. simus was remarkably similar among localities inhabited by this species before human arrival, despite varied environmental conditions. These data suggest that P. simus was likely codistributed with large-culmed bamboo in the past as it is today. The synergistic effects of predation and habitat change may explain the biogeographic retreat of P. simus to its present-day distribution in eastern Madagascar. 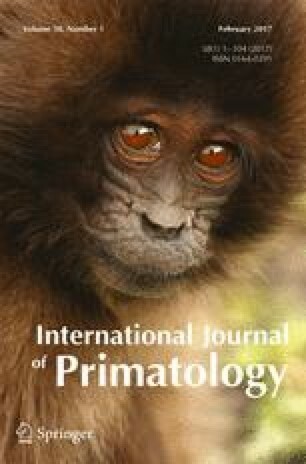 The study of predator–primate dynamics and interactions across contiguous and fragmented forests will increase our understanding of the impact of such dynamics on primate evolution, and improve primate conservation efforts more broadly. This paper is published in memoriam of Dr. Elwyn L. Simons, who led paleontological research in Madagascar from 1983 to 2008. His work resulted in the large collection of subfossil remains housed at the Duke Lemur Center, Division of Fossil Primates (DLC DFP) and Département de Paléontologie et Anthropologie Biologique, Université d’Antananarivo (UA) upon which this project is based. We appreciate the comments of Drs. Joanna M. Setchell, Steven M. Goodman, and one anonymous reviewer, which improved the manuscript. We thank Gregg Gunnell (DLC DFP), Haingoson Andriamialison, and Jeannot Randrianasy (UA) for access to specimens in their care. Daniel Jager assisted with the preparation of the manuscript and figures. This study was supported by the American Philosophical Society Franklin Research Grant and the Claire Garber Goodman Fund to K. M. Muldoon. Fieldwork at Ankarana was supported by the National Science Foundation (DBS-9207084) to E. L. Simon.This is Duke University Lemur Center Publication Number 1337. The authors do not have any competing financial interests or conflicts of interest.